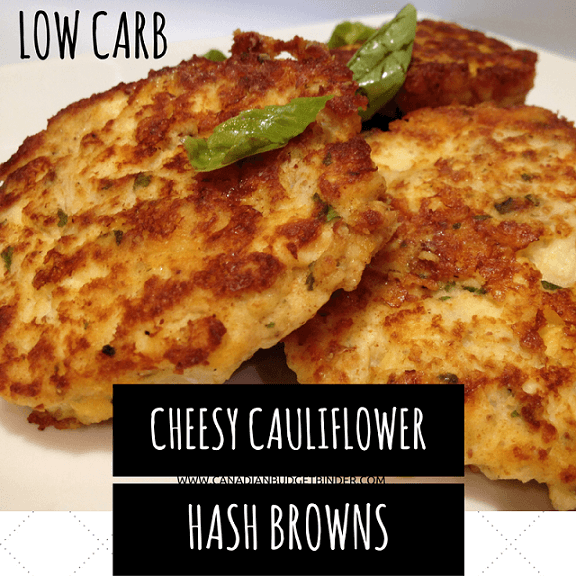 DITCH THE HIGH CARB POTATOES FOR THESE FILLING LOW CARB CAULIFLOWER HASH BROWNS. These Crispy Cheesy Cauliflower hash browns will satisfy your potato craving and perfect as part of a low carb breakfast or brunch with scrambled eggs, sausages, bacon and avocado slices. 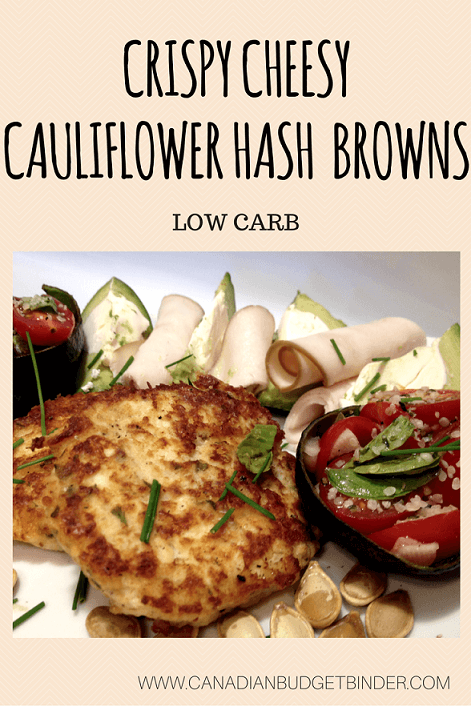 If you’re looking for a low carb cauliflower hash brown recipe that is grain-free and gluten-free this is a wonderful healthy recipe that will satisfy your tummy. I don’t exclusively eat a low carb diet but when I create some of these low carb recipes I have to admit they are darn good. Just lately I find that I’m going in for seconds and thirds and my wife who seems to catch me tells me that I must be changing my ways. These days we hardly eat bread, pasta, potatoes or anything too high carb in our house which is a good thing because too many carbs can lead to excess weight gain. In keeping with our new way of eating in the CBB house (at least for my wife) I work hard to create alternative healthy low carb recipes that she can enjoy. Mrs. CBB told me that these cheesy cauliflower hash browns hit the spot because they were crispy and the texture is comparable to what a potato hash brown would be. I love when I get positive feedback from her but trust me there have been times when I have had a low carb recipe fail but luckily, this isn’t one of them. Any time you experiment with creating recipes you will take risk which is why if you’re not a risk taker stick to tried and true recipes. When you first begin to work with almond flour, coconut flours, flax-seed and other types of alternatives to using white unbleached and wheat flours you have to get used to how they work. I’ve had my ups and downs but I’ve managed to understand just what I need to do while working with these types of ingredients. Where can I buy low carb ingredients? This is always a popular question when starting a low carb or gluten-free diet. You may find prices to be expensive when you start this way of eating but they go a long way. A quick search at health food stores, grocery stores or bulk stores in your area likely will come up with plenty of low carb ingredients you can use in your recipes. Just recently we were introduced to a website called Low Carb Canada where you can order all sorts of low carb and diabetic ingredients. We have yet to order but the prices seem to be better than what we can find at the bulk barn especially for low carb flours. Cauliflower appears in plenty of low carb recipes because it’s low carb, healthy and delicious when prepared in many ways. We try to buy cauliflower each time it’s on sale and prep it as soon as we get home. These days we can find a head of cauliflower in Ontario grocery stores for about $2.50 each. Once home we wash and chop the cauliflower into florets, let them drain and dry then place them in an opened Ziploc bag in the vegetable crisper of our refrigerator. This way when my wife has a hankering for something crunchy she just reaches in the bag and grabs some cauliflower and goes on a crunch-fest. If you find that you struggle with low carb eating it’s important to always have snacks around that you are able to eat and that are prepared in advance. These cauliflower hash browns are perfect for that snack attack. We love breakfast in the CBB house so I wanted to create some low carb breakfast ideas for my wife that she could enjoy. Using cauliflower seemed natural so I decided on making cheesy cauliflower hash browns since she no longer eats potatoes and loves potato hash browns. It was important for me to make sure they were crispy as this is something she really misses. 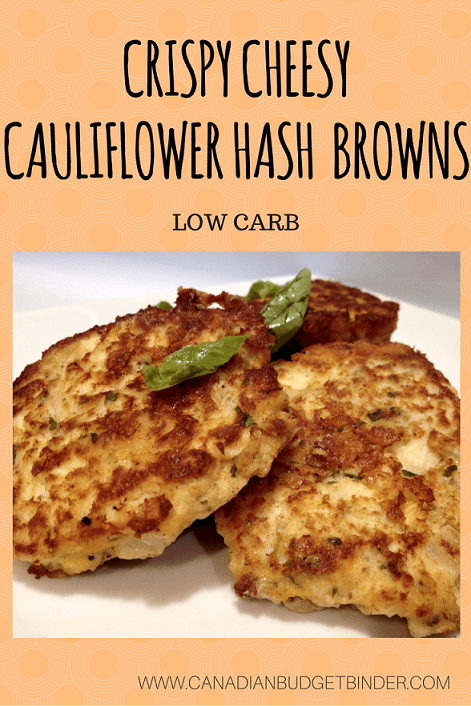 These cauliflower hash browns are perfect when the carb craving hits or part of a low carb breakfast, brunch, lunch, dinner or snack. My wife likes to eat the cauliflower hash browns cold when she is on the run especially having a toddler with tonnes of energy and limited opportunity to cook. These cauliflower hash browns take no time at all to make and you can fry them up in a skillet or on a griddle. If you fancy adding other ingredients like bacon, ham or any other meats you can however make sure they are cut small, cooked in advance before you add it to the cauliflower mixture. I’m not sure how well it will hold up when frying but you can give it a try and find out. Worst case you end up with a frying pan of cauliflower hash which would be just as delicious. Without any extras apart from onions, cheddar and mozzarella cheese these cauliflower hash browns fry up crispy in coconut oil and butter. The key is not to flip them more than once and not to cook them on too high a temperature that they will burn. I like to keep the dial around a med-high on the stove-top. Crispy Cheesy Cauliflower Hash Browns are perfect as a snack or part of a breakfast brunch meal with all your favourites like eggs, sausages, bacon and ham. In a large bowl add all of the ingredients together and mix. Note: Make sure you squeeze as much water as you can from the cauliflower. I use paper towels or a cheese cloth otherwise the y will be too wet. Place in the refrigerator for 10-15 minutes. Use a large ice-cream scoop to measure out a portion and place it in your hands to form a round hash brown. You should be able to make around 8-10 depending on your scoop size. Place them on platter and put them back in the refrigerator for 10 minutes to chill. In a frying pan add ½ cup of coconut oil and ¼ cup of butter to medium-high temp. Once the oil is heated place your chilled patties in the frying pan. I like to fry 4 at a time and leave the rest in the refrigerator to chill. If you need to add more coconut oil or butter to the pan do so that way they won't burn. You need to make sure they are frying in proper amounts of oil. Flip once after about 3-5 minutes. You can check underneath to see if it is crispy and brown by lifting it up and looking. Eat them as soon as possible while they are hot and crispy for the best cauliflower hash browns you’ll ever taste. Leftovers may soften but are still delicious topped with sauce and pepperoni and put under the grill in the oven.We store them in a Tupperware container in the refrigerator or you can freeze them for later use. Total Net Carbs for recipe: 21.30g or 2.6g net carbs per hash brown. If you make the hash browns smaller than this number will decrease. What other cool cauliflower recipes have you tried? Where can I find the nutritional info for your recipes? Thanks! I’ve added the info at the bottom. Enjoy! Thank you! Now to make it asap!